Forget other vada and make these delicious vada as a tasty alternative to any other vada. Coarsely grind the corns in grinder. Bring it in a bowl, add all ingredients & mix it well. Make vade & fry them till turns to brown. 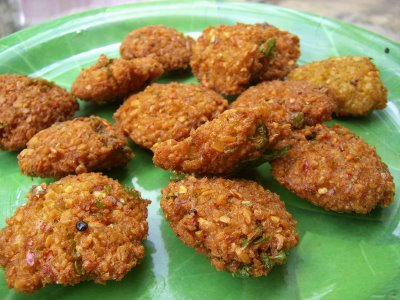 These vada seems very simple to make but really really to tasty to eat. hi foziakauser. sorry dear for late reply, but i hav a tip to decrease the sweetness of corn, just add gram flour(besan) in to ground corns,u will find sweetness is decresed & also u can bind vada so easily. thanks for nice recepie. looks yummy and simple. i wana ask is there any tip to decrease the sweetness of sweet corns? coz in USA i found it very very sweet.